Iglesia la Esperanza, a Hispanic church in Valrico, Fla. (east of Tampa), closed on 3.8 acres of property this week and the congregation has plans to eventually build on the site. They met on the property on January 11 to give thanks to God for his provision. At right, Pastor Jesus Munoz (in center) prays. 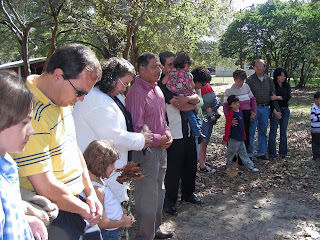 Also in the photo is Javier Forero (yellow shirt at left), co-pastor of the church. The purchase, made at a cost of $212,000, was made possible due to a gift from another church. We are so thankful for all your prayers and financial support. Our church is growing fast and Praising the Lord. Thanks for your prayers and financial support. We are growing fast and Praising the Lord.